DETROIT, Mich., Sept. 28, 2010 – Launching a new program in support of education in Michigan, Ford Motor Company Fund and Community Services partnered with the Jalen Rose Charitable Fund for a Back to School Empowerment Seminar at Cass Technical High School in Detroit, Michigan. The event took place on Friday, September 24th from 2 p.m. to 3 p.m at Cass Technical High School located at 2501 Second Avenue. Cass Tech also was the winner of the first-ever Jalen Rose Charitable Fund Mentor Program Challenge presented by Ford Motor Company Fund this past spring. Native Detroiter and ESPN analyst, Jalen Rose, hosted the event and spoke to the crowd of 600 students along with FM-98 WJLB radio personality Dr. Darrius who served as the emcee for the event. A panel of automotive and sports professionals provided career tips and information to the students. The panelists included Ford Designer Earl Lucas, Automotive Safety Instructor Joe Williams, and Erika Swilley, Assistant Director of Community Relations – NBA Detroit Pistons. To win the mentor program grant, Detroit Public High Schools were challenged to create a mentoring program that would pair high school juniors/seniors with freshmen/sophomores. As the winning school, Cass Tech will be awarded a $7,500 grant to implement the program as well as the back to school empowerment seminar. The mentor program challenge drew applications earlier this year from high schools across Detroit. 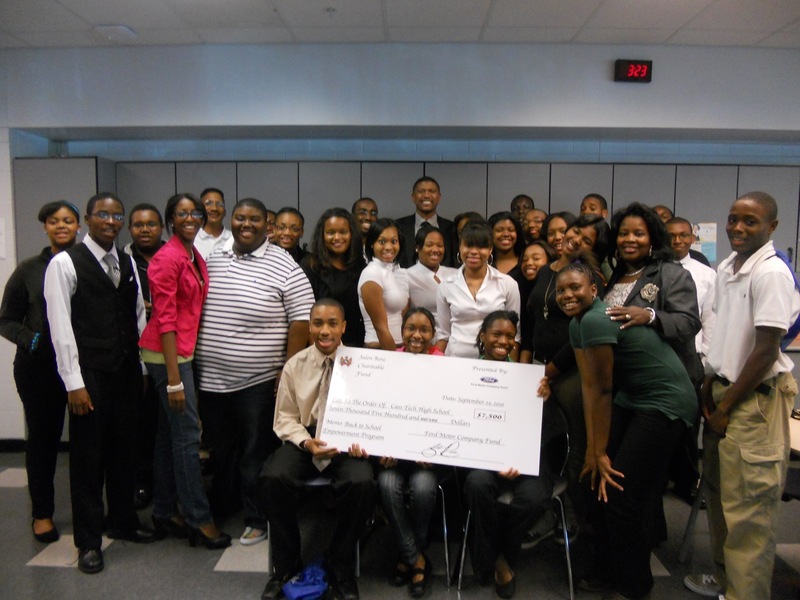 The winning program aims to strengthen peer relationships and increase retention in high school. “Ford Motor Company is proud to continue our legacy of supporting education,” said Jim Vella,President, Ford Motor Company Fund and Community Services. “The Mentor Challenge Program is just one way Ford can help to inspire the next generation of innovators in Metro Detroit.” Vella said. “As a former Detroit Public School student, I understand the challenges these students face and that is why I am devoted to improving the graduation rates in my hometown. The purpose of this challenge is to increase student engagement and ultimately assist them on their path to graduation,” said Jalen Rose. Ford’s latest commitment to supporting education in Detroit builds on a legacy of investment in educational initiatives. These initiatives include awarding scholarships to 145 Detroit high school students this summer through Ford’s Blue Oval Scholarship initiative, which aims to decrease high school drop out rates and encourage post secondary education. Ford also has a national award-winning high school curriculum, Ford Partnership for Advanced Studies and supports local education institutions. A special thank you to Women Supporting Women, Robert Williams and Kennisha Williams for writing the winning grant proposal. The after-school mentor program, Transition Buddies, is being facilitated by Cass Tech teachers Verynda Stroughter, Christopher Liner, Pamela English and Principal Phillips. Ford Motor Company Fund and Community Services is committed to creating opportunities that promote corporate citizenship, philanthropy, volunteerism and cultural diversity for those who live in the communities where Ford operates. Celebrating its 60th anniversary in 2009 and made possible by funding from Ford Motor Company, Ford Motor Company Fund supports initiatives and institutions that foster innovative education, auto-related safety, and American heritage and legacy. National programs include Ford Partnership for Advanced Studies, which provides high school students with academically rigorous 21st century learning experiences, and Driving Skills for Life, a teen-focused auto safety initiative. The Ford Volunteer Corps, established in 2005, continues Ford’s legacy of caring worldwide. Through the Volunteer Corps, Ford employees and retirees participate in a wide range of volunteer projects in their communities. For more information on programs made possible by Ford Motor Company Fund and Community Services, visit www.community.ford.com.